Adventure touring jackets are usually built for function. They are 3/4 length jackets designed to hold up against inclement weather, not show up on the cover of a fashion magazine. They are not much to look at, but they'll keep you warm and dry in a downpour. They'll provide decent air flow on warm days, but you'll never be cool and hip. 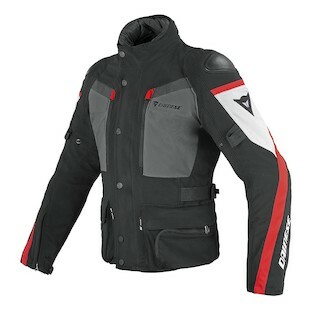 The Dainese Carve Master Gore-Tex Jacket is not your run of the mill adventure touring jacket. 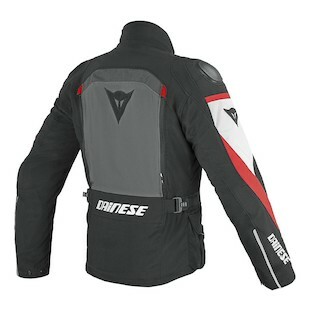 Dainese molded shoulder protection is pebbled to look like leather. The look is much more refined compared to the metal shiny shoulder armor from Dainese's racier options. Gore-Tex is built right into the outer shell, so you won't have to worry about a waterproof liner. The Carve Master includes a removable thermal liner, but you won't need it. The jacket is so stylish that you will look smoking hot. Guys who rock the Dainese Carve Master are master's of their own universe. They are connoisseurs of the finer things in life, like riding a motorcycle through mud puddles, rain drops on faceshields, and seeing your breathe before cold morning rides. They are one odd breed of motorcyclist. They take their expensive italian shoes hiking. They don't worry about getting their Armani suit a little dirty while performing regular chain maintenance. This jacket will look at home lane-splitting through traffic on a Monday morning, tearing up canyon roads, and even a quick jaunt on your local fire road. It would look just fine going down the runway during fashion week or filling up at the gas station.